London VTS manages and oversees safety of navigation in one of the largest and most diverse VTS areas in the UK covering an area of some 600 square miles of waterway spanning 95 miles from Teddington to the North Sea. London VTS operates from two state of the art VTS Centres located at the Port Control Centre in Gravesend and at the Thames Barrier Navigation Centre in Woolwich and handles the movement of about 100 commercial ships each day. 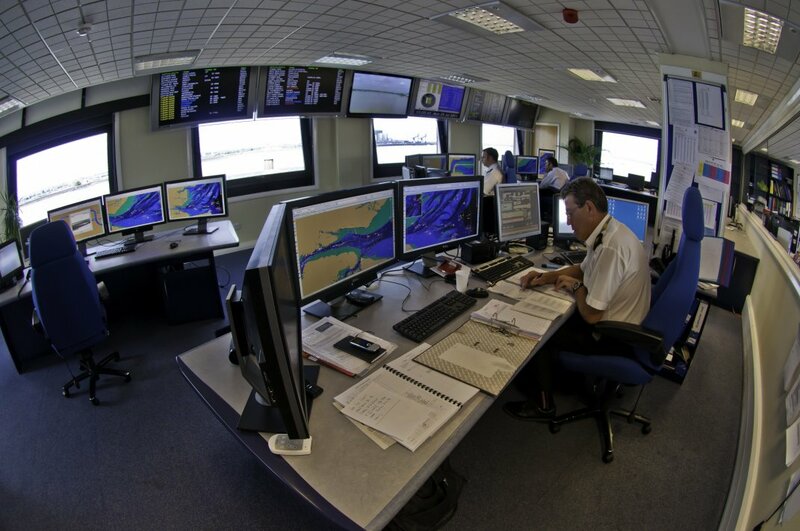 The Port Control Centre (PCC) - situated on the Thames at Gravesend - provides the VTS (Vessel Traffic Services) system for the Port of London area which includes the Thames Estuary. This not only tracks ships on their voyages in and out of London, but also enables the PLA to offer navigational advice, weather and tidal information, and other vital safety guidance. Maplin is an 18m catamaran built for us in 2015 by C-Truk in Colchester and Brightlingsea, Essex. Entering service in 2016, Maplin is 17m long and 6m wide, powered by 2 waterjets. It has a resin-infused composite construction keeping it light, robust and efficient. Its low-profile wheelhouse and foldable mast help it negotiate the tight bridges of the Thames with ease. It also houses a retractable hull-mounted multi-beam sonar, a moonpool, an A-frame and a deck crane. The vessel is fitted with a Lamour brush disk cartridge system installed between the Catamarans two hulls. When operating in collection mode the brush system is lowered by hydraulic rams, until it is partially immersed in the polluted water. Oil floating on the surface of the water is forced into the cartridge by the forward motion of the vessel and onto the oleophilic fibre brushed fixed to the circumference of each of five disc wheels mounted on a common axle. As the discwheels are rotated through the polluted water, oil sticks to the brushes and is carried up to the top of the cartridge where it is removed from the brushed into a collection tank by a series of scraper blades. The vessel has two 4 tonne holding tanks in the catamaran hulls. Due to high demand for Open Day tours, only a few places now remain. If you’d like to book a spot on the day, please visit our information desk on Royal Terrace Pier. Please be advised that these places are quite limited and will be allocated on a first come, first served basis.